On Tuesday in Fort Myers, Justin Morneau took a round of batting practice and then joined his teammates for a few minutes of long toss. Similar scenes play out repeatedly in Florida and Arizona, but yesterday’s news about Moreneau was worthy of a banner headline. Morneau has not played since this collision on July 7, 2010 resulted in a severe concussion (Photo: Reuters). If you’re confused, just think about how Morneau must feel. On July 7 of last year, the Twins slugging first baseman was on his way to another MVP year (.345/.437/.618). In the eighth inning of that night’s game, however, his season came crashing to a halt…literally. After leading off the inning with a line drive single to center, Morneau succeeded in breaking up a double play, but in the process slammed his head into short stop John McDonald’s knee. After the collision, Morneau slowly walked off the field under his own power. Yesterday was the first time he returned to it. At the time of the injury, Morneau was considered “day-to-day” with a mild concussion and, according to manager Ron Gardenhire, was available for pinch hitting duties the very next day. Obviously, that initial diagnosis was incorrect because the former MVP still isn’t 100% and there are no guarantees that he will be ready by Opening Day. In an effort to avoid any set backs, the Twins plan to gradually ease Morneau back into his routine. Meanwhile, the first baseman will be sporting sun glasses at the plate and in the field in an effort to limit the debilitating impact of the sun. Both are very sensible precautions, but the fact that they are still required over eight months since the concussion is a little scary. Morneau is not the only recent player to severely suffer from a concussion. In addition to all of the other ills faced by the Mets over the past few years, the team has had three players impacted by a serious head injury. In a spring training game against the Dodgers in 2008, right fielder Ryan Church suffered his first concussion of the season when he collided with second baseman Marlon Anderson. Then, on May 20, the outfielder incurred another head injury from a knee to the head while breaking up a double play: the exact same kind of play as Morneau. David Wright sustained his concussion after being hit in the head by a Matt Cain fastball. The side effects of Church’s head injuries dogged the outfielder all season, but it still took some time until the team finally caught on to the extent of his troubles. As a result, the organization (from the GM to the medical staff on down to the coaches) was soundly criticized, particularly for having Church take a cross country flight soon after the second injury. Undoubtedly, the Church case taught the Mets some valuable lessons about how to handle head injuries. 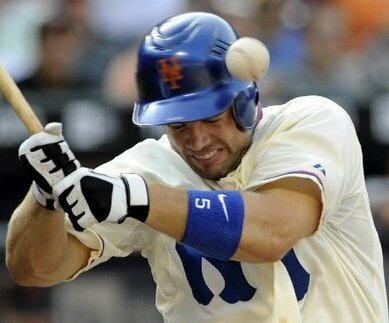 Unfortunately, those lessons were immediately put into practice when David Wright missed 15 games in August 2009 after being beaned in the head, and Jason Bay missed the last 63 games of 2010 after banging his head against the outfield wall at Dodger Stadium. Although in a much less publicized way, the Yankees have also had to deal with player concussions. The Record’s Bob Klapish wrote an outstanding article about Jorge Posada’s recent experience with head injuries. 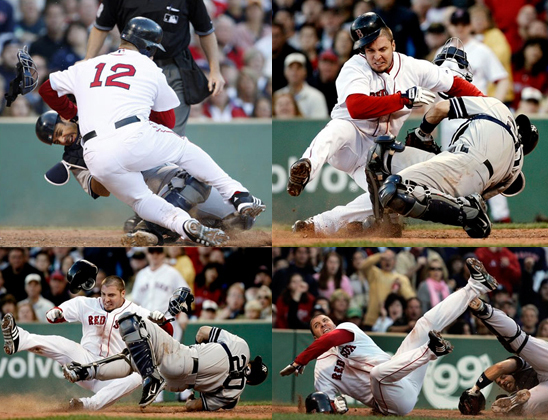 In particular, Klapish recounts a game on September 7, 2010 in which Posada was hit squarely on the mask by a foul tip. Although the veteran catcher had absorbed similar blows in the past, this one had a much more serious impact. After Posada’s injury, the Yankees took all the necessary precautions, including having a battery of tests conducted at New York-Presbyterian Hospital. Despite being cleared to fly with the team and play shortly thereafter, Posada told Klapish that some of the test results were “not good” and admitted he still has lingering concerns about how the injury will impact him in the future. The aforementioned examples are really just the higher-profile tip of the iceberg. Over the past several years, many players have suffered concussions (Mike Matheny, Ryan Freel and Casey Kotchman, just to name a random few), and the number of reported cases seems to be growing each year. There are several theories as to why this might be the case (i.e., stronger players who swing harder and throw faster), but it could just as well be that baseball is only now coming to fully understand, and therefore properly diagnosis and treat, concussions. For all we know, concussions may have been as much a part of the game’s history as peanuts and crackerjacks. In fact, one controversial study even went so far as to draw a link between Lou Gehrig’s ALS and the impact of concussions. 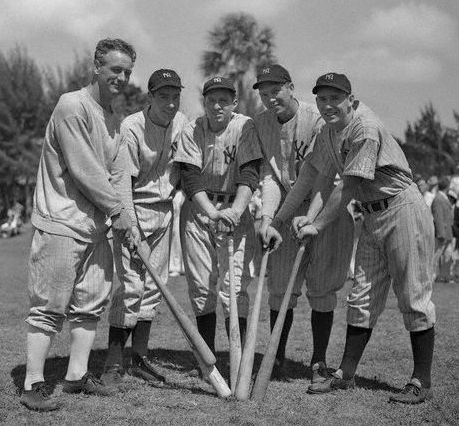 In this photo from Spring Training 1939, a noticeably withered Gehrig poses with his lineup mates (Photo: Corbis). The mention of Gehrig brings the story full circle. Before initially feeling the effects of the disease that would eventually kill him, the Yankees’ Hall of Famer was annually putting up numbers like Morneau was last year. In 1938, however, he first noticeably began to slow, and then in the spring of 1939, the ravaging toll of ALS was evident to all. The sight of a withering Gehrig had to concern his teammates, and the growing limitations of his ability must have frightened the Iron Horse. One wonders if some of those same concerns and fear exist on the field at Fort Myers? Although there is no reason to believe Morneau won’t eventually enjoy a full recovery, the sight of the hulking first baseman still limited by an eight-month old head injury has to be at least a little disconcerting. One way to avoid concussions would be to outlaw violent plays like this one. I am sure Jorge Posada would agree. So, what can baseball do to help combat the dangers of concussions? The most important step it can take is to ensure that proper diagnosis and treatment standards are strictly maintained. Then, instead of wasting money chasing blood tests for HGH, the sport could pour most of its R&D dollars into things like better helmets, catcher’s masks, and outfield wall padding. Additionally, full contact plays like collisions at the plate and takeout slides at the bases could be reigned in so as to comply with rules already on the books. Finally, roster provisions like a flexible concussion-only disabled list could be enacted. Although baseball isn’t a full contact sport, it is still a very physical game. Concussions may not pose the same risk to baseball as other more violent games, but that doesn’t mean MLB can’t lead the way in combating them. Every injury may not be avoidable, but it would be inexcusable if players continue to have their careers cut short because something that could have been done wasn’t. In the meantime, here’s to hoping Justin Morneau returns to the Twins lineup in a big way…even if it means doing some damage against the Yankees.